Памер гэтага PNG-прагляду для SVG-файла: 800 × 571 пікселяў. Іншыя разрозненні: 320 × 229 пікселяў | 640 × 457 пікселяў | 1 024 × 731 пікселяў | 1 280 × 914 пікселяў | 840 × 600 пікселяў. Digital reproduction of the Star Spangled Banner Flag, the 15-star and 15-stripe U.S. garrison flag which flew over Fort McHenry following the Battle of Baltimore in the War of 1812. Seeing the flag during the battle, and again the following morning, inspired Francis Scott Key's song The Star-Spangled Banner, now the U.S. national anthem. During the battle a smaller "storm flag" was flown; it was replaced by this larger flag early the next morning, which is the flag Key saw then. This larger flag is now displayed at the National Museum of American History in Washington, D.C. For several decades it remained in the family of Fort McHenry's commanding officer, before being given to the Smithsonian in 1912. The family cut pieces out of the flag from time to time as gifts. The original flag was 42 feet long and 30 feet high, with each stripe being about two feet, and the stars being about two feet in diameter. It was made by Mary Young Pickersgill and her assistants. More info on the original dimensions here. The stars seem to mostly point to the side, except for one (the bottom right) which points down. 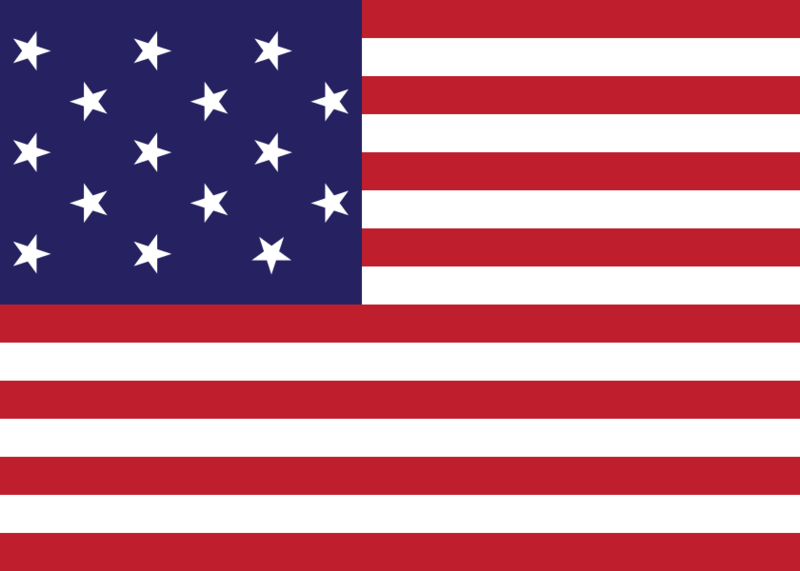 One star has been cut out of the actual flag, so I'm guessing that originally pointed to the side as well (Fort McHenry flies a flag (File:Ft mchenry 15starflag.jpg) with a similar star pattern, but it looks like they are all to the side, and the other dimensions look similar to a modern flag). I guesstimated other dimensions and star positions based on File:Star-Spangled-Banner-1908-1919.jpg; the union (blue area) looks to be about 19 feet wide. The star rows look to be evenly distributed; i.e. the distance between the top/bottom edges and the center of a star row looks to be about the same as the distance between two (centers of) rows. Not so left-to-right; they are pretty close to the right edge and even closer to the hoist side. I don't think this is eligible for copyright (just duplicating as closely as possible an existing PD flag) but if in case it is, then I release all rights to the public domain. 03:44, 3 верасня 2015 840 × 600 (2 KB) Clindberg Reverted to version as of 19:27, 8 June 2015. Star positions are incorrect looking at original flag. 06:32, 12 студзеня 2011 840 × 600 (5 KB) Clindberg Reverting... those are different dimensions than the ones specified. Please upload as a separate file as an alternative.